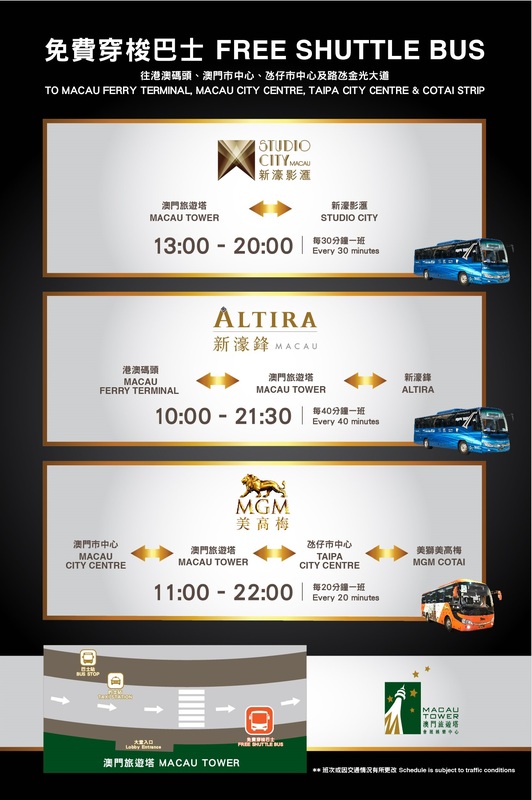 Your ticket also includes entry to the Macau Tower Observation Deck. Take a closer look at the breathtaking views and watch as adrenalin junkies bungy jump from the top! Try some other activities at the Macau Tower: Dinner Buffet and the Lunch Buffet! Food is nice. Long wait restaurant to start to admit. Good to state in voucher that they only start admitting at stated timing. High tea with a difference: a view from 223 meters up! Indulge in a luxury tea set including delicious savory items and sweet treats whilst enjoying views across Macau and China. The 360° Café slowly rotates as you dine, so you'll be treated to an ever-changing view. Alternatively, get star treatment from the moment you ascend with an express lift pass plus indulge in freshly brewed coffee and one of Macau’s favourite delicacies, a delicious Portuguese Egg Tart, at the stylish mezzanine 180° Observation Lounge. What's more, your ticket also includes entry to the Observation Deck for a better look at the views, not to mention the courageous adventurers bungy jumping from the top! A very good experience indeed. When we first went up the sky was a bit misty because of the rain. However it cleared up later. Our includes some snacks which was very good as we sat and enjoy the view. After that we walked around and as our package included the use of the telescope we had very good view. We also went up to the floor where there were some dare devils who did the bungee jump. We saw how they were dressed and coached in what they need to do when they did the jump. It was very interesting. A very good experience indeed. When we first went up the sky was a bit misty because of the rain. However it cleared up later. Our includes some snacks which was very good as we sat and enjoy the view. After that we walked around and as our package included the use of the telescope we had very good view. We also went up to the floor where there were some dare devils who did the bungee jump. We saw how they were dressed and coached in what they need to do when they did the jump. It was very interesting. Redemption was so easy and quick. Table was reserved for us already. Had fanta stic views from rotating table with nice and cakes desserts. Enjoyed coffee and watched bungee jumping. Redemption was so easy and quick. Table was reserved for us already. Had fanta stic views from rotating table with nice and cakes desserts. Enjoyed coffee and watched bungee jumping. A must activity in Macau. Visit the Macau tower to see the very beautiful city view. Also include the snacks package at cafe 180. They are delicious. A must activity in Macau. 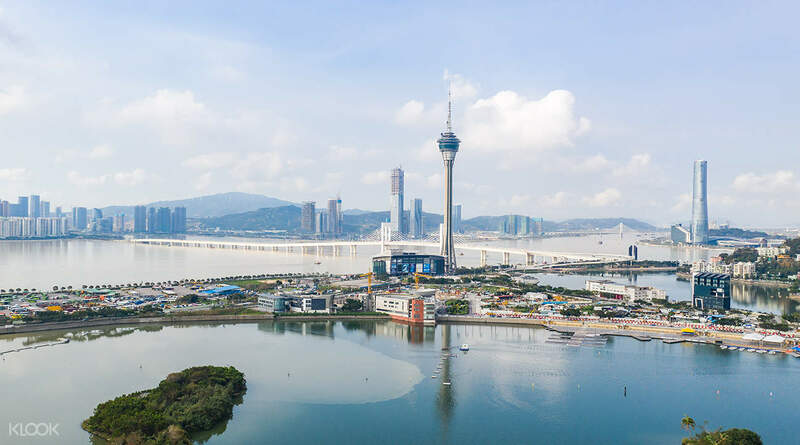 Visit the Macau tower to see the very beautiful city view. Also include the snacks package at cafe 180. They are delicious. the food was amazing. and the view too. the crew were very polite as well. perfect way to see macau on a very perfect day. the food was amazing. and the view too. the crew were very polite as well. perfect way to see macau on a very perfect day. I came here a little late because covering most places in Macau in a day for an ambitious traveller like me got me to lose out on lapping some relaxing afternoon tea time. I had only 20 mins but they still served me. The snacks were awesome and totally worth the prize. One mist have this experience. May be in coming years Macau will have an even incredible skyline. One can see lot of awesome buildings taking shape. I will do this activity again. It was my first to lap up some luxury in a rotating sky deck. I came here a little late because covering most places in Macau in a day for an ambitious traveller like me got me to lose out on lapping some relaxing afternoon tea time. I had only 20 mins but they still served me. The snacks were awesome and totally worth the prize. One mist have this experience. May be in coming years Macau will have an even incredible skyline. One can see lot of awesome buildings taking shape. I will do this activity again. It was my first to lap up some luxury in a rotating sky deck. A good experience having tea while watching bungee jumpers! A good experience having tea while watching bungee jumpers! Good activity in Macau. We are enjoy the nice view and high tea on top the tower. Good activity in Macau. We are enjoy the nice view and high tea on top the tower. The experience is great!! They (our children) really enjoy the food and the rides.. The experience is great!! They (our children) really enjoy the food and the rides..